Windsor Spitfires goalie Michael DiPietro. Photo courtesy Michael DiPietro/Twitter. 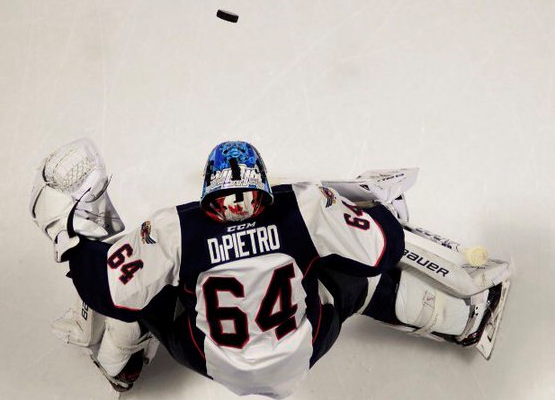 Michael DiPietro cemented his place among the Windsor Spitfires` greatest Saturday night. He stopped 30 shots out of 32 attempts in goal to pick up his 80th OHL victory in the Spitfires` 5-2 over the Sarnia Sting at the WFCU Centre. He broke the franchise win record last week with 79 career wins. The Spitfires leapfrog the Sting in the OHL West Division standings with 17 points for third place. Sarnia is now in fourth with 16 points. Curtis Douglas continued his scoring tear by putting in the first puck of the game, his fourth goal in as many contests, at 2:15 of the first period. Windsor doubled the score before the intermission on Daniel DÀmico`s third goal of the year. The Spits added another goal in the second period when Luke Kutkevicius scored his fifth of the season, extending the Windsor lead to 3-0. Connor Corcoran made the Spitfires` lead 4-0 with a power play goal at 1:20 of the third period before the Sting finally got on the board. Anthony Salinitri put in his eighth puck of the season at 9:16. Windsor`s Cole Purboo responded later in the frame to make it 5-1, but Sarnia gained one more goal before the end of regulation with Justin McCombs` first goal of the season. Aidan Hughes took the loss between the pipes for Sarnia, with 22 saves. The Spitfires will go for their third win in a row next Saturday night when Guelph visits. The Sting head to Flint for a rare school day game set for 11 a.m. Wednesday. The pregame show starts at 10:40 a.m. on 103.9 FM – 1070 AM CHOK.